In October 2009, Megan and Christopher Pierson welcomed daughter Saylor at a local hospital near their home in Newport Beach, California. Even though their little one was born six weeks early, the proud parents were thrilled. “She was pink and crying and looked perfect,” Megan recalls. As a routine measure for preemies, Saylor was taken to the neonatal intensive care unit, but just one hour later she had a breathing tube in place and was being prepped for transport to a nearby pediatric hospital. Saylor had been born with a heart defect, tetralogy of Fallot with pulmonary atresia, which was depriving her tiny body of sufficient oxygen. Despite their fear and confusion, Saylor’s parents took time to thoroughly research various children’s hospitals. After speaking with renowned cardiothoracic surgeon Vaughn Starnes, MD, at Children’s Hospital Los Angeles, they decided to entrust him with their daughter’s care. It turned out, Saylor’s heart defect was so serious that she required multiple lifesaving procedures in the first few weeks of life—and spent about 300 days of her first 18 months in the hospital. Starnes performed Saylor’s first open-heart surgery when she was just 10 days old, and she has undergone four more open-heart operations since. 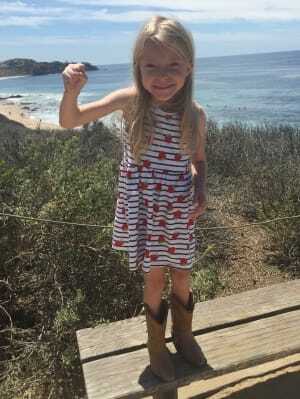 The most recent, in July 2015, was to place a new artificial valve conduit, which connects her right heart to the pulmonary artery to improve blood flow to her lungs and take pressure off the right heart. Although it’s been more than a year since her last surgery, Saylor seems to “hit every roadblock,” as her mom puts it. “But then we just come up with a new plan.” For a while, she needed a G-tube to help with her nutritional needs, but that was removed in March 2016 much to Saylor’s excitement. Also last spring she developed a serious infection of the heart called endocarditis, which meant she needed intravenous antibiotics through a special IV called a PICC line for six weeks. But even that didn’t slow her down as she simply went to school with her PICC line like it was no big deal. Like many kids with heart defects, Saylor is small, but she is growing and getting stronger every day. “Now that her heart is really functioning as it should, she’s not burning as many calories and she’s gaining weight,” Megan says. Today, Saylor is a joyful first-grader who loves to read and spend time with her sisters, Elle and Scotlyn. They especially like to jump on their trampoline and ride bikes together. Just this summer Saylor mastered the two-wheeler: No more training wheels! Megan and Christopher Pierson are founding members of the Heart Ambassadors, a growing community of grateful patient families and friends of the Heart Institute at CHLA. “Through the Heart Ambassadors, we have a group of parents who are all on the same journey; people that we can walk through life with,” Megan says. To minimize the need for invasive surgeries, reduce recovery times and improve outcomes for children with heart defects, the Heart Ambassadors have committed to raising at least $2 million of the $5 million needed for construction of a state-of-the-art hybrid operating room, in which cardiothoracic surgeons and interventional cardiologists can work together to perform complex procedures for children with heart defects. Help kids like Saylor survive life-threatening heart defects by donating today. Visit CHLA.org/GiveLA to make a tax-deductible gift to Live L.A., Give L.A. for Children's Hospital Los Angeles.